A friend of mine just had her first born a few months ago, and upon hearing that I'm pregnant she shared me one pregnancy tip that might help me when it comes to stretch marks. But then, it got me thinking. Will I get one? While I'm completely aware that it's part of pregnancy and stretch marks vary on skin’s elasticity whether you'll get a few or none, I'm not obsessing at all. I just want to try if there are products that would help lessen, if not prevent, stretch marks from pregnancy. Besides, wala naman mawawala 'pag susubukan, right?! So I've searched for lotions designed for stretch marks and was recommended a body butter that it totally perfect for my concern. Oh, wow! A body butter! My niece gave me The Body Shop's website so I could browse their products, especially the body butter variants. 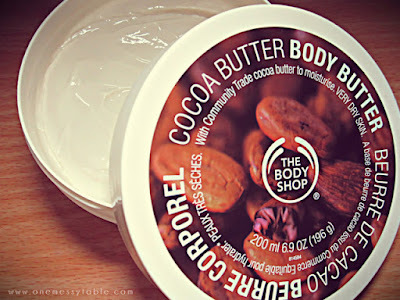 But this particular one, the Cocoa Butter, according to their site is best used for very dry skin (like mine!) and helps pregnant women in preventing stretch marks. So the very next day, I went to The Body Shop store at Market! Market! and bought one for me! Yay! I did a little asking about the product as well. From what the sales lady told me, Cocoa Butter is their best-seller product for pregnant women because of its effectiveness. I was also told, that for those who already had stretch marks, their Shea Butter is perfect for treating them. Alright, Cocoa Butter for preventing and Shea Butter for treating. Got it! Now let's talk about the product itself. Here are some thoughts I could share with you based on my 56-day use. I bought this at around Php800+. It's a little bit pricey for a 200ml lotion/moisturizer but I can attest that the price is worth it, considering the benefits that I'm getting. I can also say that this body butter has a long way to go because of its thick texture, you only need a small quantity each time you use it, so I'm guessing there will be more left after giving birth. Moisturizing-wise, the body butter is easily absorbed by the skin. It made my skin soft and the smoothness lasted the whole day even with just 1 application. For me, though, I use it twice a day because I love how it feels on my skin. Oh, there's only one - the scent! The Cocoa Butter has a nice chocolate scent, but I'm not a fan at all. Don't get me wrong, I just don't fancy the scent as of now (blame it on the hormones), but the good news is, it's completely tolerable. So no worries on that, we have our own preferences, right?! To sum it all, I highly recommend The Body Shop Cocoa Butter especially to the those who are expecting. I still cannot guarantee the effectiveness of this product YET since I'm only using this for 56 days now and has a long way to go. But for a 25th-week belly, there are no signs of stretch marks at all. Good news!!! This product is effective! My belly is clear with only minimal stretch marks and almost close to not having at all. I think what happened was I didn't put too much body butter on my lower belly and focused on the upper area instead. They appeared at the lower area along the linea nigra and the lower right-hand side or the appendix area. The stretch marks were not huge nor long and there were no discoloration or darkness, pretty much the same tone with my skin. Oh, and I still have body butter left and continuously using it! Yay! Am I sad with the stretch marks? Of course not! I was actually excited seeing a few ones because it's like having a badge for an achievement I got. These are wonderful battle scars, a reminder that my body was able to 'house' a 7.8lbs baby girl and I'm proud of it! Will I still use it? Definitely! I'd still use this product on my second pregnancy.